Collins Foods ((CKF)) operates more than 250 restaurants and food service retail outlets. The Company is a KFC franchisee in Australia and Europe (Netherlands and Germany), a Taco Bell franchisee in Australia, the owner of Sizzler restaurants in Australia and a Sizzler franchisor in Asia. CKF is the largest KFC franchisee in Australia, with 228 stores. Both the KFC and Taco Bell brands are owned globally by Yum! Brands. CKF’s franchises are held through individual agreements with Yum! Brands and CKF are required to pay Yum! Brands annual loyalty payments. We consider the recent weakness in the share price places CKF in value territory, with the shares now trading on a 1-year forward P/E multiple of 14.6x, which is not demanding in the context of the defensive revenue profile and potential earnings uplift over the long-term from expansion in KFC Europe and Taco Bell. Notwithstanding the challenging short-term performance of the KFC Europe division, the long-term growth opportunity in Europe remains significant in light of an expanding store footprint, SSS growth and margin improvement. For KFC Australia, the Company has the ability to maintain EBITDA margin over FY19/20 and support SSS growth on the back of the digital menu/delivery strategy. 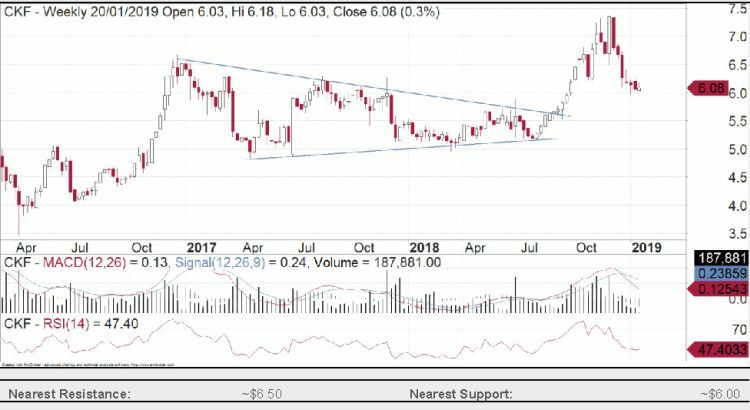 From early 2017 to mid-2018, CKF traded in a symmetrical triangle before breaking out near $5.70. It rushed up to well over $7.00 but has been coming back the last several weeks. It looks a bit weak in the short term. It is finding support near $6.00, and if that can't hold, then we also have support back near the breakout zone of $5.70. The longer-term picture still looks positive, but we just need more evidence of support coming in in the short term.